It's been so long since I've done much diving that it's not just my gills that are drying out, it's also my heart. I've been so busy. I've been too busy. My wife has more sense though. She fixed me on a dive with a friend for our anniversary. It's really what I needed. A nice mellow warm up dive to remind me how it's done. Maybe stay shallow where it's a bit warmer and the colors are bright. Something relaxing and low stress. Yeah, right. 2 1/2 hours of killer traffic. Get my gear in the boat without forgetting anything or twisting my knee. At least the crossing was calm. We geared up and I knew of one minor problem I had. I have not gotten a compass together, but on a warm up dive like this how much could I need it? Besides, I have my new Dive Tracker. Who needs a compass then? You hang it off the boat and it sends out a sound pulse. The marker sized receiver unit I carry has small LEDs that flash to give an idea of the direction and distance to the boat. We jumped in and moved to the anchor line before descending. Down into the blue or maybe it was just black. I've been there before. I was following Mel, so I didn't turn on my light until about 60 feet. I saw the bottom at 110 feet. Mel moved 10 feet across the sandy bottom before he hit his first bug. Then all bets were off. I wanted one of those for myself. I moved up the slope of the sand just a few feet before I could see the reef. I wanted to move fast, but there was some heavy elephant ear kelp and I had to look under it so I wouldn't miss any strays. I moved into the rocks until I hit the vertical wall of the reef. I looked around and then moved back out again, flashing my light over the sand to see if there were any red dots of eyes reflecting back. I have a powerful light and I had forgotten how it gets swallowed by the blackness of an overcast night. I moved on and snatched a nice one from the base of some kelp. It was in the bag. I kept seeing some small ones, but few legals. The kelp was a beautiful golden brown in my light. They were brilliant orange sponges and some golden zoanthids. There was little current and as usual the chill did not touch me. I wanted to go as far as I could before moving up the reef. There were boulders and pockets that went 10 feet into the rock. I decided that realistically I had to stop and see what my Dive Tracker showed me. I needed to learn to use it eventually. I knew the boat was on the other side of the reef, but mostly up. I wanted to learn what it took to read the maximum signal as indicated by the small red and green LEDs. I aimed it in the general direction of the reef and was getting signals from everywhere. I thought about it and tried to figure out if I could get a usable reading. Well, probably this wasn't the best time to be learning how to use it. I pointed it out over the sand away from the reef and the boat..... I still got a signal. Figure that with the sender right over the top of the pinnacle, it was sending out sound signals like a hose spraying water down on a ball. Signals would be everywhere. It was time to go back to hunting. I turned around and grabbed another one, but I was already thinking of moving up the reef. High-pressure tanks run low very quickly at depth. It was beautiful higher on the reef. There were more small kelps and lots of different invertebrate life. The blacksmith's were thick. Still, most of the bugs were a bit short. I was at about 65 feet so I knew I was about to run out of reef. You have to be a little careful on this one. It's so pointed that if when leave it you are very unlikely to find it again in the water column. I saw Mel, but I also saw a bug in a crack. I didn't think I could get my hands on it, so I decided to see if I could scare it out with my light. I should have used my hand. It didn't move until I pushed on it with my light. As soon as it moved I dove into the open space behind it, but I never saw it again. Mel was nearer than I thought, because he was using his small backup light. His main light had flooded. In the short time I had left, I tried to search where I didn't think he had been. There was no giant kelp on top of the rocks, so I just did an ascent with my light off, sometimes checking my gauge, but mostly swinging it around to trigger bioluminescence. These weren't the big ones. They were millions of small sparkles of green. Yeah. A great warm up dive. I got my gear off and walked out the back again. I stood on the dive platform and took in the wonder of the night. It was overcast and so very dark, but it was clear under the clouds and I could see across the water to the lights of the San Pedro and Long Beach water fronts as well as the lights up by Malibu. It was a beautiful calm night. Earlier in the evening as we passed a certain unmentioned spot, I threw out a big bag of frozen ab guts with a rock to carry them down. It’s hard to say if any lobster would find them, but it was a spot that we had planned to dive since early in the week. Well when we motored over to it there were about 20 hoop nets on the spot. Neat. Well, Mel isn’t shy, but he is a good boat handler, so he pulled up just inside the lighted net floats, about 100 feet from where we wanted to dive. We were about 140 feet from the netter’s boat. Note that it was glassy calm with no current or wind. I was going to follow Mel far enough to get a direction to where we wanted to be. I remembered it as a small area in the reef. We hit bottom in 60 feet and headed west. It was nice terrain and beautiful brown kelps growing thick with lots of smaller fish. I saw some large garibaldi right away. I was careful to keep Mel in sight, which is not so easy even when he is letting you. After about 60 feet, it looked great so I peeled off. (I hear that he hit a nice pocket of bugs about 20 feet further.) It was gorgeous. I was moving around but holding the same heading as before. I actually saw a hoop net. It was about a foot and a half off the bottom, sitting on top of brown kelps. It looked like there was a legal underneath it. I turned right and passed on. I remember this kind of diving in big rocks with thick bottom growth. 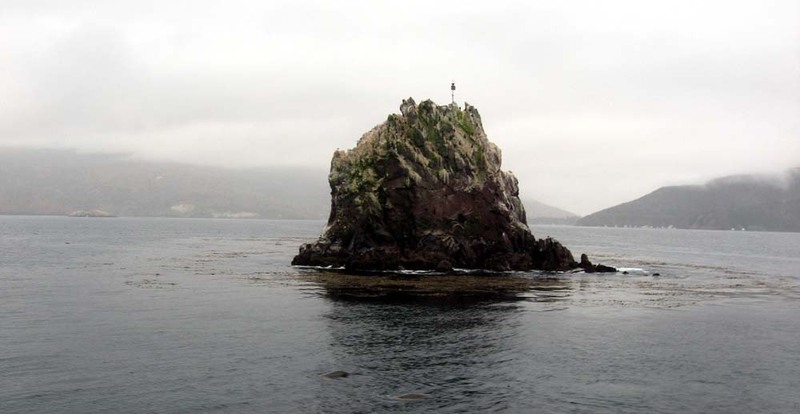 The kelp canopy was thick 2 to 3 feet above the rocks. I dove under it and crawled between the rocks. That’s my world. I was travelling low through a little canyon and found a nice sized rock scallop on a rock the size of a small loaf of bread. I didn't have an iron and didn't want to take the whole rock, so I passed by though it would have been tasty. Just a bit further I ran into the problem of diving Catalina front side reefs. A fishing line was over my light arm. Hmmmmm. Time to stop and think. I pulled on it to get a feel for what it was. I wasn't sure if it was attached to the reef, but it seemed a bit strong to break. I tried to lift it over my arm, but had no idea if I had cleared it. I was thinking of grabbing a rock to cut it, as my cutter is in my pocket, but I saw what looked like a legal bug and made a dive for it. I thought I had missed, but I had it clutched under my arm against my chest. I wanted to be careful of my movements to avoid entangling more, so I carefully put it in my bag. As I moved, it felt like the line was actually in my bag clip. I carefully pulled it out, fastened my bag and moved away. No more line. I kept working my way deeper in what I hoped was the correct direction. It was a beautiful kelp reef that went on and on so I wasn't too concerned with where I was, but I still wanted to find that spot I had been to before. I decided I had to break and try my Dive Tracker again. Hmmm. So that's why they give you a magnet on a lanyard. They said the receiver unit would stay on for two hours after getting its last signal from the sender unit.... sort of like a dive computer. That was a miscalculation. The unit was completely off and I had no magnet to turn it on with, so it was time to hunt. In just a bit, amazingly I found the artifact I was looking for. Last time I was here, right in this area I had found a number of nice bugs. Not this time though. I circled some looking in all directions. It wasn't a shock that I didn't see any as, you know, they can walk, but I had been hopeful. I decided to follow the drop off some and make a quick check to see if any were deeper. The water temperature had dropped and it dropped more as I moved down. There was a noticeable current and it was going the wrong way. I was moving below the thickest part of the kelp reef and could actually see bare rock on the wall between the deep kelps. At 105, I said it was time to go. No bugs and a strengthening current. I started moving up the steep slope fairly fast, trying to guess which direction the boat lay. It got warm and lush and gold again. Again I was in thick kelp, up and down in canyons between rocks. As I travelled under the kelp I saw lots of small fish and some short bugs, but there was nothing legal. It was as beautiful as a night dive gets. I got into about 45 feet which felt warm and I figured that was about the depth of the boat. I was pretty much out of gas, even for me, so it was time to move up. I looked up and saw that someone was waving a light at me from above and a bit behind. I guessed it was one of the hoop netters. I figured I'd help him out some so I turned off my light and continued on the way I was going. I think that baffled him. I finally puttered to the surface and was 25 feet from my boat. Well, so much for high tech navigation devices. The hoop netter had something to say that wasn't worth hearing so I got aboard and dumped my gear. Again I stood on the dive platform to enjoy the night. No shooting stars tonight though. It was warm enough that I felt in no hurry to get changed. Mel showed up after a while. He had done OK, but wanted to go try Isthmus High Spot to fill out his bag. I had only brought two tanks so I planned to just enjoy the quiet evening. We anchored in the very dark night and Mel headed in. The Isthmus was full of various lights. Warm clothes and a fruit cocktail can make a nice difference. I stood on the dive platform enjoying the sights, sounds and smells. It seemed to smell of sea and rain, yet with a twinge of Santana wind. The lowering overcast had made the mainland into a soft orange glow. 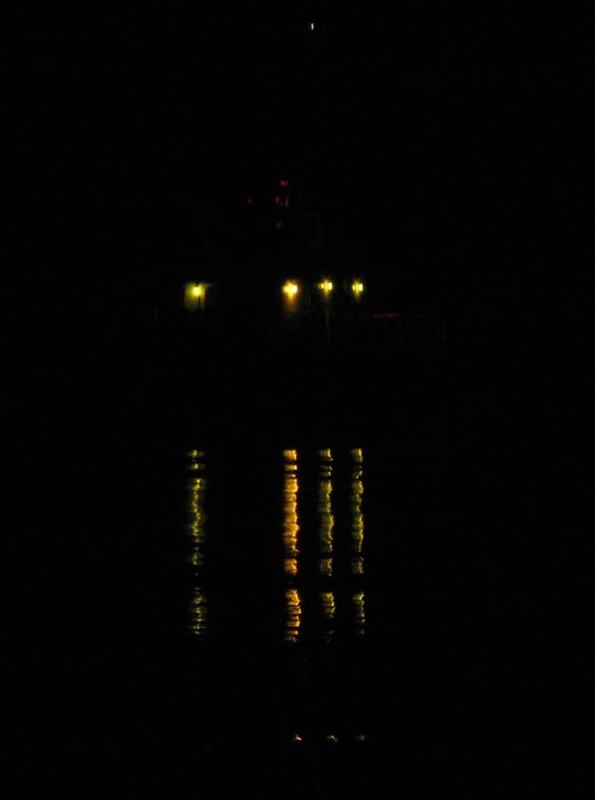 Solitary red lights showed boats anchored for the night. Harsh white lights broke the dark on shore at the dock and on some commercial boats. I don't know what that bright blue light meant, but I did wonder about F+G. It never moved. Mel came back and said it had been a fun productive dive. His bag was now filled out. After he changed we made our last entries to our lobster cards and called it a night. The morning broke quite mellow in contrast to Mel's lightening strong Cuban coffee. 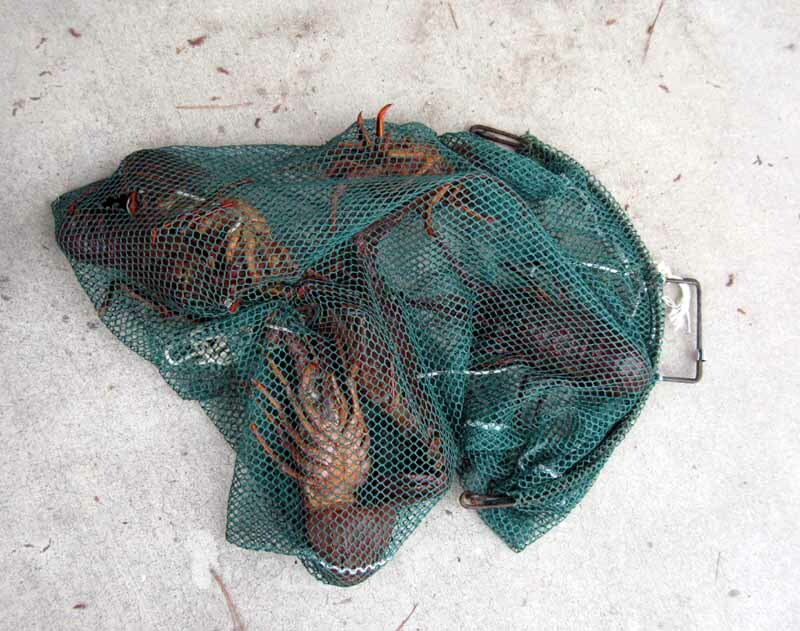 We moved slow, enjoying the beauty of the morning and got the nights lobster report from Tom. They had done well outside of Indian Rock. Mel and I both had chores back in the real world, the dry one, so we headed back across the waveless channel. Part of the way we were accompanied by porpoises. They were feeding, but some joined us to ride the waves of the wake. Mel slowed to oblige them and I took some video. Ah, I wish I could swim and jump out of the waves like that. We rounded Angel's Gate and so ended another great trip to the Channel Islands.